Nora, a piano-playing cat owned by Betsy Alexander, rests her head as she depresses piano keys Thursday at her home in Philadelphia. Los Angeles ? 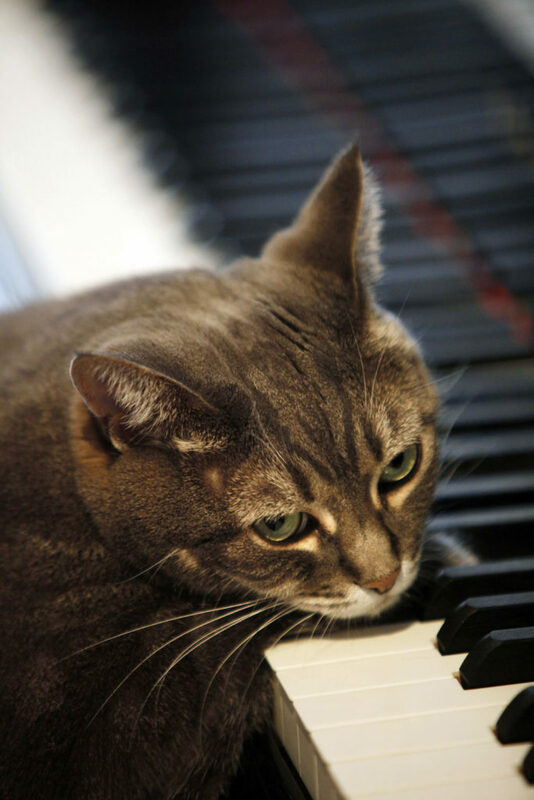 Nora the piano-playing cat is living the Hollywood life in Philadelphia. Fresh from a Lithuanian concerto written just for her, the YouTube sensation gets fan mail by the bushel, has her own groupies and could be an addict if her owners ever forget to put the catnip away. The 5-year-old tabby’s latest cyber splash was Lithuanian conductor Mindaugas Piecaitis’ first composition, featuring Nora’s solo video performance in what he called his CATcerto. The performance with the Klaipeda Chamber Orchestra on June 5 has become a Web sensation at catcerto.com, with hits closing in on 1 million. In all, nearly 20 million people have watched Nora play. She has made the television talk show circuit and has videos, two books, her own Web site, a blog, three calendars, mugs, greeting cards, T-shirts and posters under her belt. Nora is owned by piano teacher Betsy Alexander, 53, and her artist-photographer husband Burnell Yow. They live in a house splashed with floor-to-ceiling color with five other cats: Gabby, Max, Rennie, Miro and Clara. Alexander said Nora, a photogenic green-eyed shelter cat, has been a diva as long as she’s known her. In fact, the day they found each other, at a Cherry Hill, N.J., shelter, there was a sign on Nora’s cage that said “bossy.” She doesn’t like other cats. Nora has an agent, her own photographer and an entourage. But she isn’t into bling (make that collars) and she doesn’t like riding in a car — even a limo — or a plane. “She loves visitors. She is a very gracious performer and she feels indebted to her public,” Alexander said in a telephone interview from her home. Nora doesn’t play just any piano, she plays a Yamaha C5 Disklavier — a Lamborghini of a piano, Alexander calls it. Most of her performances come when someone else is playing the turn-of-the-century, ivory-keyed and restored Briggs piano next to the Yamaha. A music teacher in Japan wrote to say Nora had superb technique and she used Nora as an example to her students on how to strike the keys. Nora releases the key instead of pounding it, Alexander explained. Nora purrs when she plays. And when she dances, it is in circles on top of the grand piano. When she was young, she chased her reflection so long she would get dizzy and fall off the piano, Alexander said. These days when she gets dizzy, she just changes direction. Nora does have one little problem. “She loves to eat. She will eat as much as she possibly can. She’s not picky either — fried chicken or filet mignon. She’s like a little bowling ball, just roly-poly, like a seal,” Alexander said. Her size hasn’t affected her popularity, though. Alexander is putting the finishing touches on a gift book called “Nora the Piano Cat’s Guide to Living the Purr-fect Life,” and Nora has also gotten offers from magazines, cat toy manufacturers and fellow musicians. Alexander has been swamped by cat owners who want her to teach their cats how to play. A sock monkey sends Nora a love note every Valentine’s Day. She’s had offers of marriage, notes of encouragement and video messages.